For manuscripts submitted from 1 June 2016, all referee and editor reports, the authors' response, as well as the different manuscript versions of the peer-review completion (post-discussion review of revised submission) will be published if the paper is accepted for final publication in NHESS. The process of peer review and publication in the interactive scientific journal Natural Hazards and Earth System Sciences (NHESS) differs from traditional scientific journals. It is a two-stage process involving the scientific discussion forum Natural Hazards and Earth System Sciences Discussions (NHESSD), and it has been designed to utilize the full potential of the Internet to foster scientific discussion and enable rapid publication of scientific papers. Initial access peer review assures the basic scientific and technical quality of manuscripts posted in NHESSD. Subsequent interactive discussion and public commenting by the referees, authors, and other members of the scientific community is expected to enhance quality control for papers published in NHESS beyond the limits of the traditional closed peer review. Also in cases where no additional comments from the scientific community are received, a full peer-review process in the traditional sense, albeit in a more transparent way, is assured before publication of a paper in NHESS. The editor is asked to evaluate whether the manuscript is within the scope of the journal and whether it meets a basic scientific quality. They can suggest technical corrections (typing errors, clarification of figures, etc.) before posting in NHESSD. Further requests for revision of the scientific contents are not permitted at this stage of the review process but shall be expressed in the interactive discussion. After acceptance of the manuscript for public peer review, it appears as discussion paper (preprint) in NHESSD and is citable through DOI. The discussion phase represents a unique opportunity to engage in an iterative and developmental reflective process. During this phase interactive comments can be posted by designated referees (anonymous or named) and all interested members of the scientific community (named). All participants are encouraged to stimulate further deliberation rather than simply to defend their position. This enhancement lead process is offered to maximize the impact of the article. Normally, every discussion paper receives at least two referee comments. Authors are invited to take an active role in the debate by posting author comments as a response to referee comments and short comments of the scientific community as soon as possible in order to stimulate further discussion by interested scientists. For more information see interactive public discussion. After the open discussion, the authors are expected to publish a response to all comments within four weeks, in case they have not done so during the open discussion. Based on the responses, the editor either invites the authors to submit a revised manuscript or directly rejects the manuscript. If necessary he or she may also consult referees in the same way as during the completion of a traditional peer-review process. In the case of acceptance, the final revised paper is typeset and proofread. Then it is published on the NHESS website with a direct link to the preceding discussion paper and interactive discussion in NHESSD. In addition, all referee and editor reports, the authors' response, as well as the different manuscript versions of the peer-review completion will be published (only valid for manuscripts submitted from 1 June 2016). All publications (discussion paper, interactive comments, final revised paper) are permanently archived and remain accessible to the open public via the Internet, and final revised papers are also available as print copies. The submission of comments and replies which continue the discussion of scientific papers beyond the limits of immediate interactive discussion is encouraged. Such peer-reviewed comments undergo the same process of peer review and publication as described above: after appearance and discussion in NHESSD, they may also be published in NHESS if sufficiently substantial. If a manuscript that has been posted as a discussion paper in NHESSD is not accepted for publication as a final paper in NHESS, the authors have several options to proceed as outlined under frequently asked questions, point 6. For further information on the definition and standing of discussion papers, please read the EGU Position Statement on the Status of Discussion Papers Published in EGU Interactive Open Access Journals. All interactive comments are fully citable, paginated, and archived as a supplement to NHESSD. 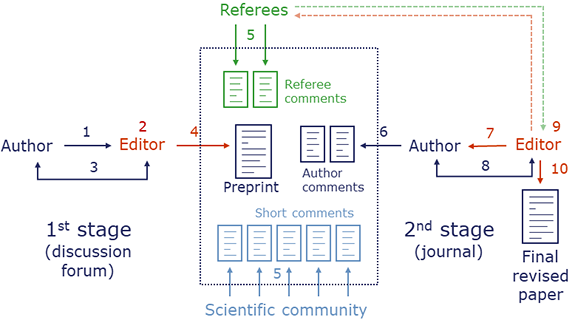 The referees are asked to post one or more referee comments, and every registered member of the scientific community may post short comments as defined above. The authors of the discussion paper have the option (but no obligation) to reply by posting their own short comments individually, or by posting author comments collectively on behalf of all co-authors. The authors of a discussion paper are automatically informed via email about the appearance of comments in the interactive public discussion of their paper. Alert services will also be available to other members of the scientific community. The interactive comments are supervised by the editors, who have the option of censoring comments that are not of substantial nature or of direct relevance to the issues raised in the discussion paper or which contain personal insults. Authors are advised to follow the discussion of their paper and to notify the editor in case of abusive comments. The NHESS editorial board reserves the right to exclude abusive commentators. After the open discussion, no more short comments and referee comments can be accepted. However, the contact author and the editor of the discussion paper have the opportunity to post final author comments and editor comments, respectively. The final response phase is generally limited to 4 weeks (can be extended to 8 weeks) and automatically terminated upon upload of at least one author comment, although further author and editor comments can be posted if appropriate. The authors are supposed to answer the referee comments and relevant short comments cumulatively or individually in one or more author comments. Based on the response, the editor either directly accepts/rejects the manuscript for final publication in NHESS or asks the authors for further revisions.